Malinda, the slower 1/2 of @TwinsRun, finished the rainy Rock 'n' Roll DC Marathon in 3:54:58, It was her 16th marathon, 6th attempt to BQ and 1st marathon in the rain. If only we were born in April instead of May, 3:54:58 would've been a 2016 BQ. However, since we were born in May, Malinda will try 2 more times to finish in 3:45 or less - the Charlottesville Marathon on April 4 and the Rivanna Greenbelt Marathon in September (date to be determined). Malinda didn't reach her BQ goal but you can help us reach her Team Lemon fundraising goal of $345. No donation is too small to fight childhood cancer with Alex's Lemonade Stand Foundation. Text "LEMONADE E1121983" to "85944" to donate $10 by text. Or, donate $3,$4, $5 or more online: www.alexslemonade.org/mypage/1121983 and thanks for your support! Did you run any of the Rock 'n' Roll DC races on Pi Day? Let us know and we'll add your recap to our list! The Best Day of My Life by Train. Race. Repeat. 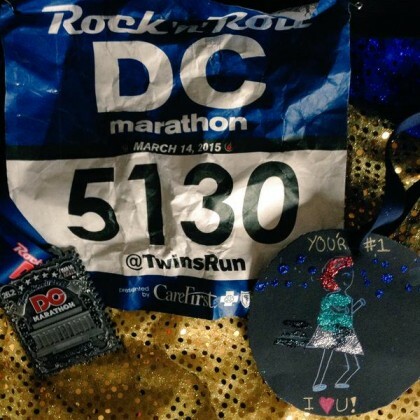 Rock n Roll DC Race Recap – Hello, Sub-2! by You Signed Up For What?! Thanks for including The Aqua Life! Awesome to read other recaps, too!